Location: Fruitville Road (at Beneva) to North Cattlemen Road. The Circus Trail runs roughly north south and will help provide a scenic trail connection between two major east-west roads, Fruitville Road and 17thStreet. Fruitville Road and 17th Street both have paved shoulders allotted for bike lanes. The closest north-south connecting road, Beneva Road, does not have bicycle lanes; the Circus Boulevard Trail will help to make biking in the area much safer. 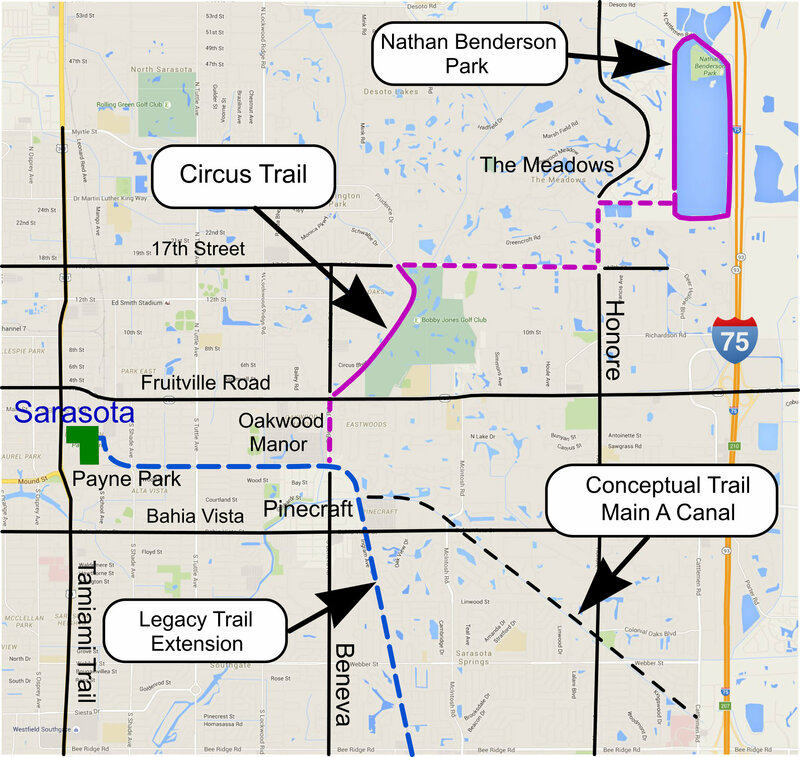 The trail will help to provide connections between the high-density residential communities to the north and the Sarasota Commons shopping center along Beneva Road. The south trailhead opens onto the northeast corner of the intersection of Beneva and Fruitville Road. The intersection has crossing lights for pedestrians and is the main pedestrian access point to the shopping center. A multi-use trail for bicycling, in-line skating, jogging and walking. Along the east side of the trail is the Main B Drainage Canal, wooded areas, and views of a major historic golf course complex—Bobby Jones Golf Course, a 45 hole municipal facility owned by the City of Sarasota. Along the west side of the trail is Circus Boulevard, named after the old circus grounds that were located nearby. 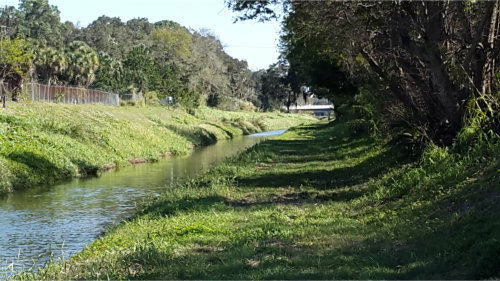 The trail links the Bobby Jones Golf Course, several neighborhood developments, a Sarasota County Fire Station, Cardinal Mooney High School, 17th Street Park and Cooper Creek Park. Connects to the Main A Trail. 10-foot wide paved trail utilizing a right of way along a drainage canal. Circus Boulevard to Fruitville Road/Beneva Road intersection. Completed July 2002. Dedication September 30, 2002. A multi-use greenway trail for bicycling, in-line skating, jogging and walking. The trail links major employment centers, Doctors Hospital, and large residential neighborhoods such as Pinecraft, Colonial Oaks, and Sarasota Springs. the trail also links Colonial Oaks Park, and Cattleman Community Center. Connects to Circus Trail and Rails-to -Trails Corridor at the North end. The trail will be paved throughout the corridor. The trail will be located in the Main A Drainage canal easement requiring additional access rights. Crossover bridges will have to be considered for access to the trail from adjacent subdivisions. User crossing will have to be addressed at Bahia Vista Street and McIntosh Road. Addional ROW acquisition may be required.